1 There has been no material change in the accounting policies adopted during the quarter / half year ended September 30, 2016 as compared to those followed for the year ended March 31, 2016. 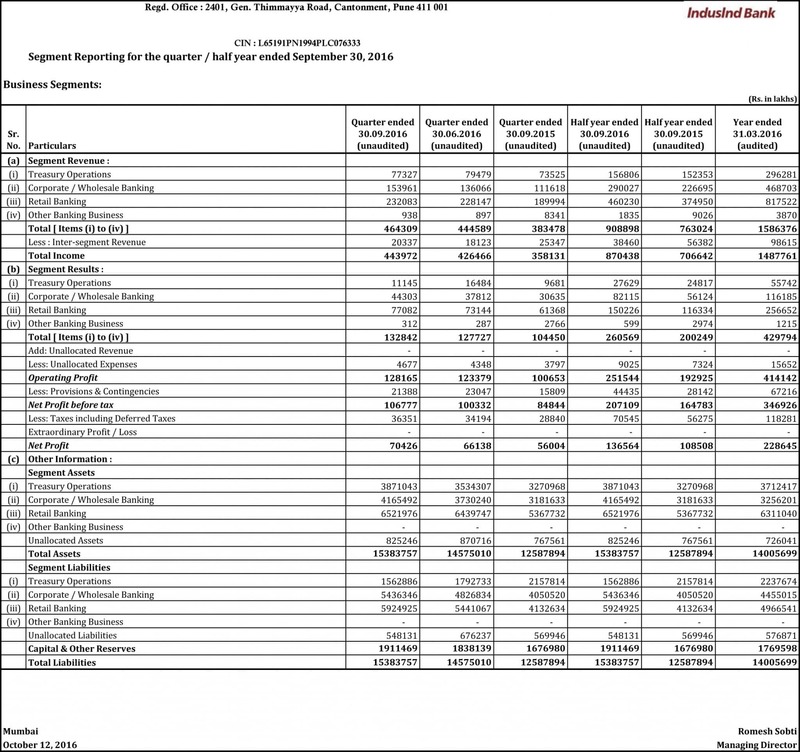 2 The working results for the quarter / half year ended September 30, 2016 have been arrived at after considering provision for standard assets, including requirements for exposures to entities with Unhedged Foreign Currency Exposure, non-performing assets (NPAs), depreciation on investments, income-tax and other usual and necessary provisions. 3 The above financial results for the quarter / half year ended September 30, 2016 were subjected to a “Limited Review” by the Statutory Auditors of the Bank. A clean report has been issued by them thereon. These financial results were reviewed by the Audit Committee and subsequently have been taken on record and approved by the Board of Directors at its meeting held on October 12 , 2016. 6 The business operations of the Bank are largely concentrated in India and for the purpose of Segment Reporting, the Bank is considered to operate only in domestic segment. On obtaining RBI approval, the Bank has commenced during the quarter ended June 30, 2016, its operation in International Finance Service Centre (IFSC) Banking Unit in Gujarat International Finance Tec City (GIFT). The business conducted from the same is considered as a part of Indian operations. 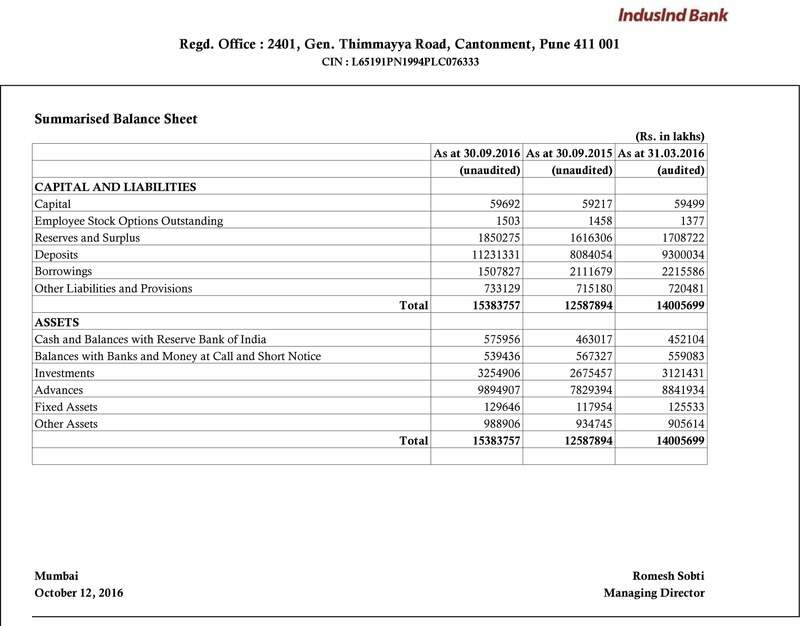 7 In terms of RBI circular DBOD.BP.BC.No.98/21.04.132/2013-14 dated February 26, 2014, in respect of assets sold to SC/RCs during the quarter ended March 31, 2015 , the shortfall arrived at by deducting sale consideration and provisions held as on the date of sale from the outstanding amount, is being amortized over two years. Accordingly, the Bank has charged to the Profit and Loss account an amount of Rs. 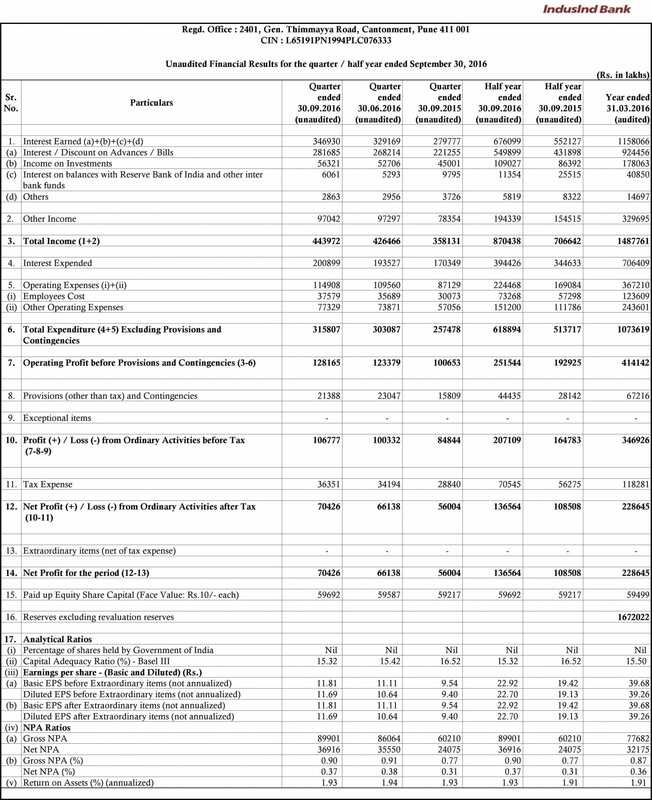 32.09 crores during the current quarter. 8 During the quarter / half year ended September 30, 2016, the Bank allotted 10,49,942 shares and 19,29,785 shares respectively, pursuant to the exercise of stock options by certain employees. No. of complaints pending resolution at the beginning of the quarter 0; received during the quarter 44 ; resolved during the quarter 42; closing position 2. 10 Previous period / year figures have been regrouped / reclassified, where necessary to conform to current period / year classification.